We are all sold out of our Perini stock but we do have some available on our Secondary Market Page. Take a look! New For 2008: Well, Beatrice is mainly working on one of a kind versions of her small limited editions now. She started doing this the last couple of years. if you want more updates on her new work - email kmlaone@dollery.com and we can keep you up to date. This is info from 2005: Well, we just couldn't resist these beauties this year! We have always loved Beatrice's work especially her Asians but this year the ballerina's are just outstanding! This year she is only offering the four in the series and is no longer doing the larger edition dolls. They are each limited to just 10 worldwide. We saw them at Idex and our personal Dollery favorites were "Isadora", "Giselle" and then probably 'Tosca"...you know, they were all just wonderful! "Mimi" is adorable too. You def. need to click on the bust shot and see the full body shot with the sculpted ballerina socks. The are full body porcelain and all the work is done by Beatrice in her studio in Italy. The porcelain is flawless on the Perini dolls. Although expensive...well worth it this year especially! Human hair or mohair wigs and glass eyes adorn each work of art. The costuming this year is exquisite. Really...good... We are accepting orders with a deposit of 25% down, bal. due when in. We can work with you on ship dates. Or we set up custom extended payment plans to suit your budget and needs thru 12/15/05. Beatrice is an exceptional artist. 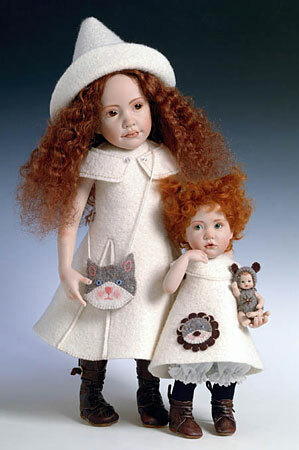 We have been watching her work since 1997 since she first began showing her dolls in the US. kmalone@dollery.com or call 781-447-6677. All the dolls are featured below.. Beatrice was born in Venice, Italy (1958), where she graduated at the Academy of Fine Arts. She worked and studied for six years at the studio of the grand Italian master Emilio Vedova. She went on to teach art at a junior-high and high school.In 1984 she discovered the world of ceramic dolls and dollmaking and set up a shop-studio, "Bambolandia" (which translates into "world of dolls"), where she began creating dolls, etchings, drawings and ceramics. In 1988 she became a member of the "Global Doll Society" and participated in the main international competitions. In the first competition Ms. Perini took part, in London, 1989, she won the first and third prizes. In Stavanger, Norway, 1991, two of her dolls won first prize and another a third prize. In Brighton, England, March 1992, she was awarded the first prize. And in September 1992 she won the most prestigious "Mathias Wanke Trophy." In 1991 Beatrice appeared in the 1991 and 1994 "Directory of Doll Art." (Biography courtesy of Beatrice Perini). 2005 Years Dolls - Click On Photo For Entire Image! Isadora - Dollery Favorite! Beautiful in person! In person I would have to say she was probably our favorite because of the soft colors she is wearing. She would fit in with the most decors. You must click on the photo to the left to see the full body shot. The others are outstanding as well though. This doll measures 44 cm. in height (17.5"). Fully jointed bisque body and special sculpted dress and thick socks. Her wig is made of handmade curly mohair and the blue eyes of beautiful hand-crafted glass. She wears a beautiful handmade tutu (ballet skirt). She stands on a wooden base with label. Giselle - Dollery Favorite! Beautiful in person! Beautiful...face...just gorgeous. Dressed in blue. Must click on the photo to see the full shot. This doll measures 44 cm. in height (17,5"). Fully jointed bisque body and special sculpted dress and thick socks. Her handmade wig is of real hair and the light-blue eyes of beautiful hand-crafted glass. Tosca - Dollery Favorite! Always... Beatrice does beautiful Asians...superb. Her handmade wig is of real hair and the light-grey eyes of beautiful hand-crafted glass. Mimi - Dollery Favorite! This one is just adorable as well. Really hard to pick this year. Her wig is made of handmade curly mohair and the green eyes of beautiful hand-crafted glass. Brown hair - grey eyes. Auburn hair with Brown eyes. Previous Years Dolls - Click On Photo For Entire Image! Photo For Entire Image! Junko - Dollery Favorite! Beautiful in person! Ltd. 25 world wide, 17 inches tall, porcelain, fully jointed, Sold out nationally to dealers. We have a very limited number. 25% down confirms your order, balance due when doll comes in. We can work with you on ship dates. Saori - Dollery Favorite! Beautiful in person! Ltd. 25 world wide, 14 inches tall, porcelain, fully jointed, Sold out nationally to dealers. We have a very limited number. 25% down confirms your order, balance due when doll comes in. We can work with you on ship dates. Taro - Dollery Favorite! Beautiful in person! "Just Like Me" Limited Editions of 50! Serafino & Cosetta - Dollery Favorites! Ltd. 50 each world wide, 12 inches tall. We are taking orders for these dolls with a deposit of 25% down, balance due when in. We can work with you on ship dates. All bisque, fully jointed boy doll with brown painted eyes and brown mohair wig. Light blue T-shirt, brown hand embroidered overalls and leather sandals. A little wooden rabbit on wheels is included. All bisque, fully jointed doll with green painted eyes and blond curly mohair wig. Light yellow hand embroidered dress with leather sandals. A little felt monkey is included. Romeo & Lunetta - Dollery Favorites! All bisque, fully jointed boy doll with blue painted eyes and blonde mohair wig. Blue hand embroidered apron with pants. Leather sandals and straw hat. A little wooden horse on wheels is included. 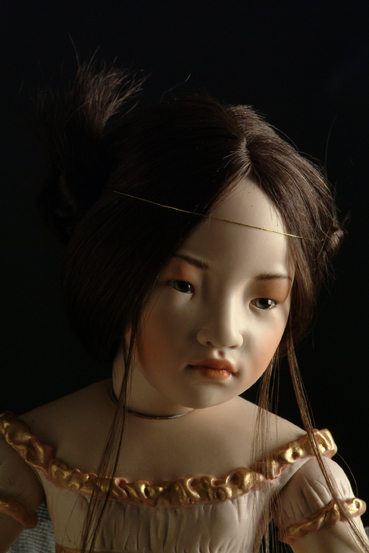 All bisque, fully jointed doll with blue painted eyes and light brown human hair wig. White hand embroidered smocking dress. Hand crocheted socks and leather sandals. A little felt rabbit and a bear are included. Giulietta & Mammolo- Dollery Favorites! 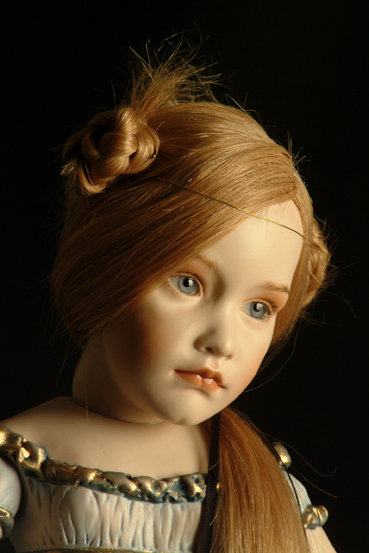 All bisque, fully jointed doll with blue painted eyes and light brown human hair wig. Two-tone pink dress with cotton hat and leather shoes. A hand crocheted balloon is included. All bisque, fully jointed boy doll with brown painted eyes and light red mohair wig. Light blue dress, socks, leather shoes and straw hat. A little felt bear is included. Zuzu & Isidoro- Dollery Favorites! 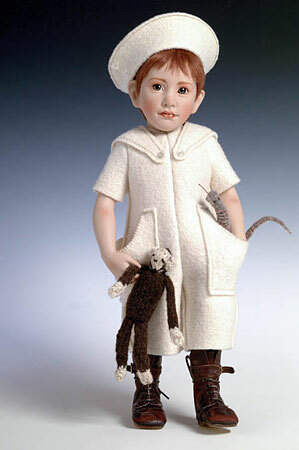 All bisque, fully jointed boy doll with brown painted eyes and dark brown human hair. Ivory smocking dress and leather sandals. A hand crocheted balloon is included. 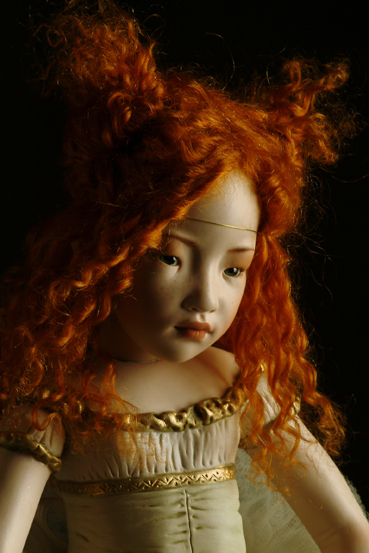 All bisque, fully jointed doll with brown painted eyes and chestnut mohair wig. Light pink hand embroidered smocking dress with leather sandals. A little felt elephant is included. All bisque, fully jointed boy doll with brown painted eyes, freckles and modelled teeth and brown human hair wig. Light blue hand embroidered overalls with blue and red cotton hat. Leather sandals. A little mouth-organ is included. All bisque, fully jointed boy doll with green painted eyes and light red mohair wig. Blue school apron with pants, socks and leather shoes. A little wooden abacus is included. 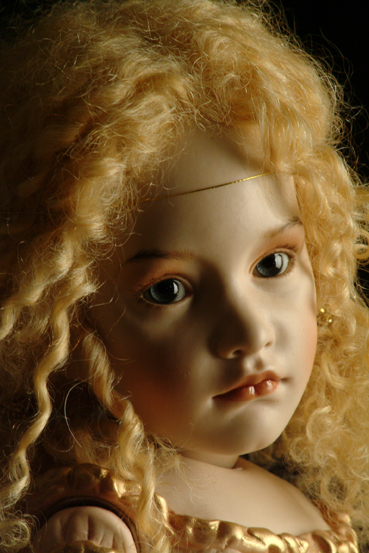 All bisque, fully jointed doll with blue painted eyes and blond human hair wig. Red dress with hand embroidered collar. Socks and leather shoes. A little wooden duck on wheels is included.